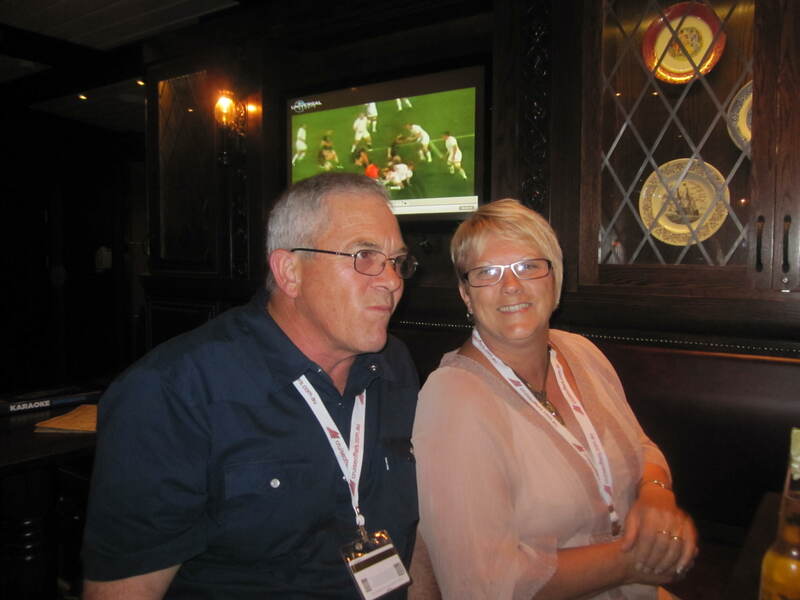 Looking at the daily newsletter “Cruise Compass” that first day, we saw to our delight, KARAOKE – yippee! 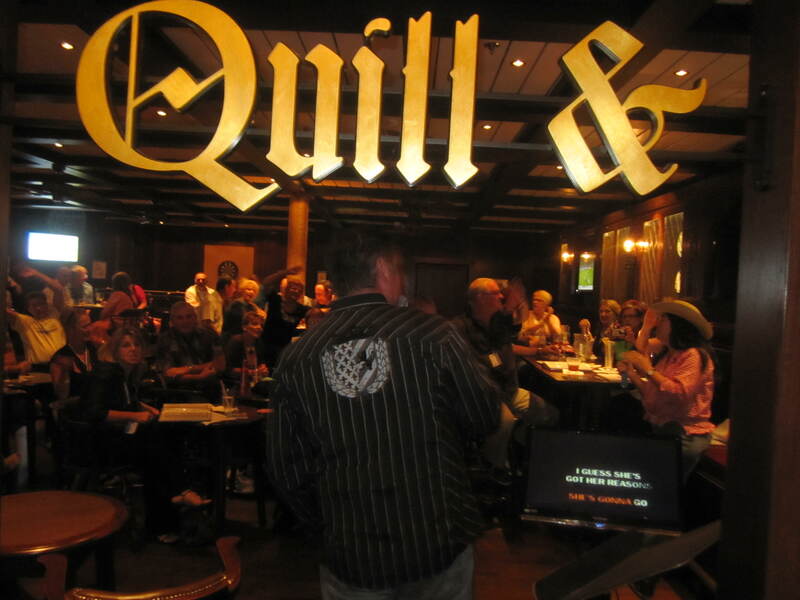 We had a bit of a warmup in our cabin, then made our way to the Quill and Compass, an English Pub on Deck 6. Funnily enough, Dutchy had sounded rusty in the room and I thought my voice sounded okay, but it reversed when it really counted. I think from all the talking at the dinner table, plus lack of practice, when I sang it sounded a bit like I was losing my voice. However, with some water and then a lovely cocktail things improved, and we had a few songs each in the 1 ½ hours allocated. That proved to be the start of several nights of karaoke, much to our delight. 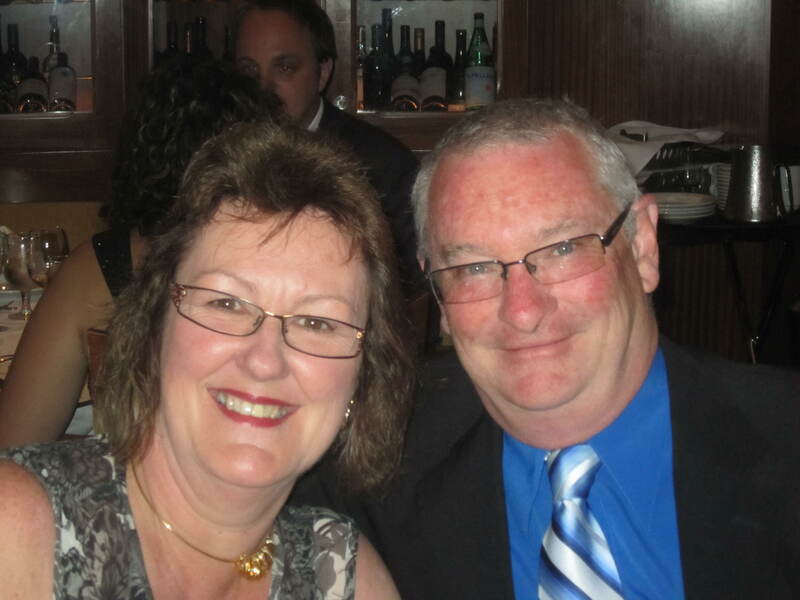 Last year we went on our first cruise, to celebrate our Silver Anniversary in January, 2010. 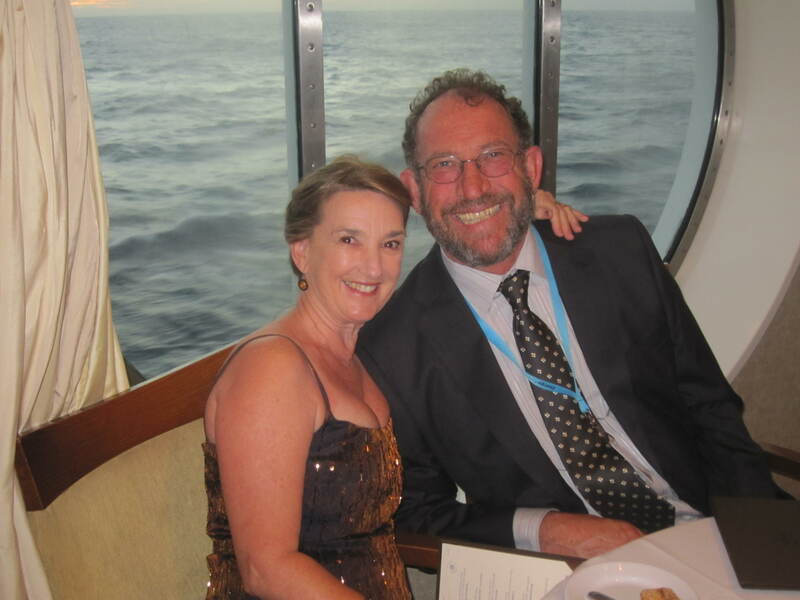 We embarked the Sun Princess at Sydney, with me hesitant about how I would cope with sea sickness. I had a bad experience on a boat returning from the Great Barrier Reef, but that was a totally different type of boat. Stablilisers on these large ships are another thing. As a preventative measure, I took a Travelcalm tablet, but later felt really bad. I had to go and lie down, and we hadn’t even left the harbour yet! Sometimes the cure can be worse than the problem. Later I discovered ginger tablets, a natural way to calm one, plus travel wrist bands. 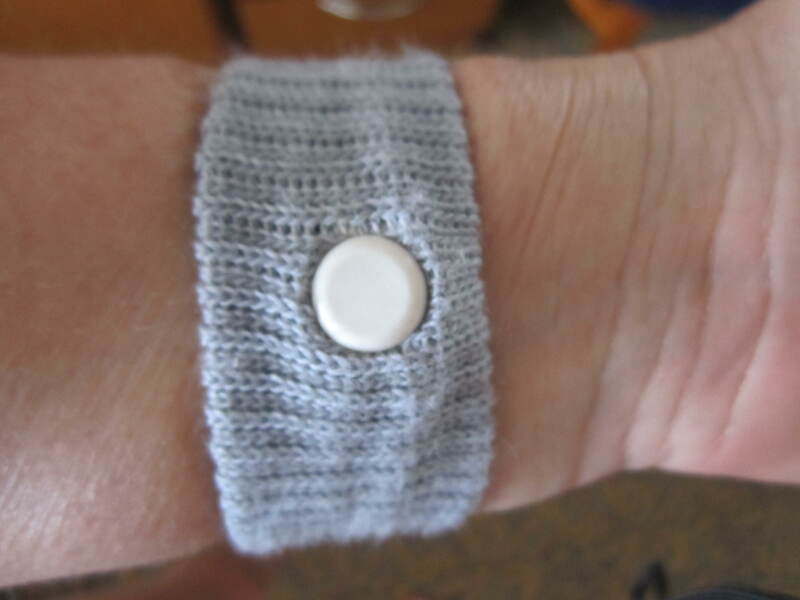 The wrist bands are made of a knitted stretchy fabric that wraps tightly around, with a type of bead that presses into your wrists. It’s a form of acupressure that really works. So this time around we took a couple of ginger tablets and put the bands on for a day or so, and then we were fine. It’s not so different from being on an aeroplane, with that constant background motion, which has never bothered me. I was up too late for the stretch class that I wanted to attend, so we were going to walk around the designated “jogging track” but it was so glary I decided I may as well do my cardio in the gym. I walked on the treadmill for 15 minutes, watching Dutchy do his laps as he made his way around the track, coming past me at intervals. Then I did the reclining bicycle for another 15, equalling my mandatory 30 mins. Later I returned to the gym and did 15 minutes on the rowing machine, inspired by my cousin Amelia’s husband Ted, from Brighton UK. The best thing about cruising is being able to do as much or as little as one likes. Dutchy laughs at me because I want to do everything the first day, but I am merely enthusiastic. When I entered the table tennis tournament I was paired with a teenage girl. We managed to win our first game, but were defeated in the next round, so we missed out on the medals. I’m sure they were only plastic, but anyone who knows me understands that I have a competitive streak. Later when I was paired with another lady to do the digital photo scavenger hunt, I was slowed down because she was wearing sandals unsuitable for running. She was almost 80 into the bargain, but let’s not be ageist! Then my camera battery ran out, so at least she had one, but of course when we took our forms back (and lost 2 points because we were 2 minutes later than the allowed 20), we couldn’t show my photos. The organiser just had to believe us, but the team who won had three (young) people running around so of course they got more points. Yes, I like to win, but I don’t mind losing if the rules are equitable. I continued working on my blog. It’s fantastic on a cruise, if you feel like a cuppa or snack, just call room service and order in. I do it ’cos I can! And you don’t pay extra for it, unless it’s between midnight and 5am. Meanwhile, Dutchy had joined up with Mick and Bruce to play poker amongst themselves, as the actual tournament run by Caribbean International would have cost $75. Oh, and food; did I mention that?! Of course there is lots of it, but I am trying not to be ridiculous, as well as exercising regularly. From buffets in various areas to the dining room for dinner the quality is quite high and we are glad we chose the earlier 6pm sitting, so that by the time you go to bed you have had a chance to digest some of the three-course meal! 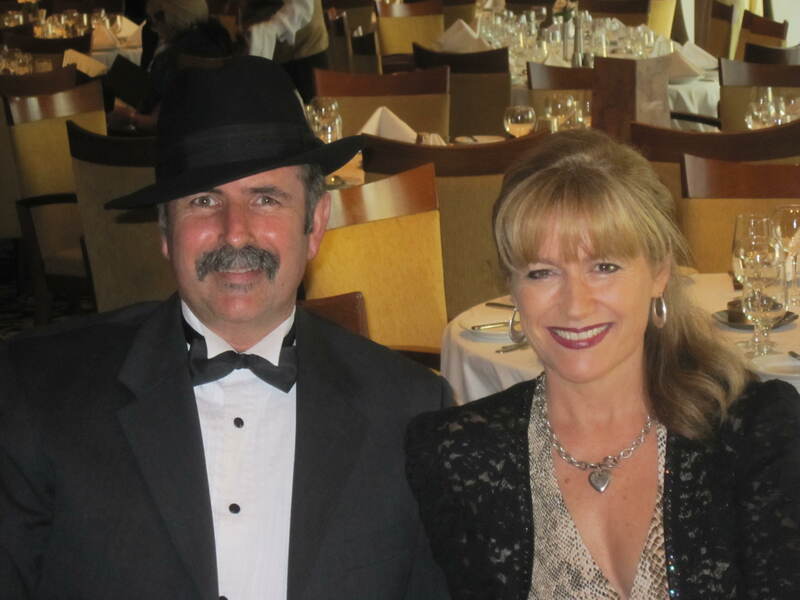 We all put on our glad rags for dinner, with Dutchy happy because he had retrieved his suit and shirts, and the rest of us enjoying getting dressed up for the first of three formal nights for this cruise. 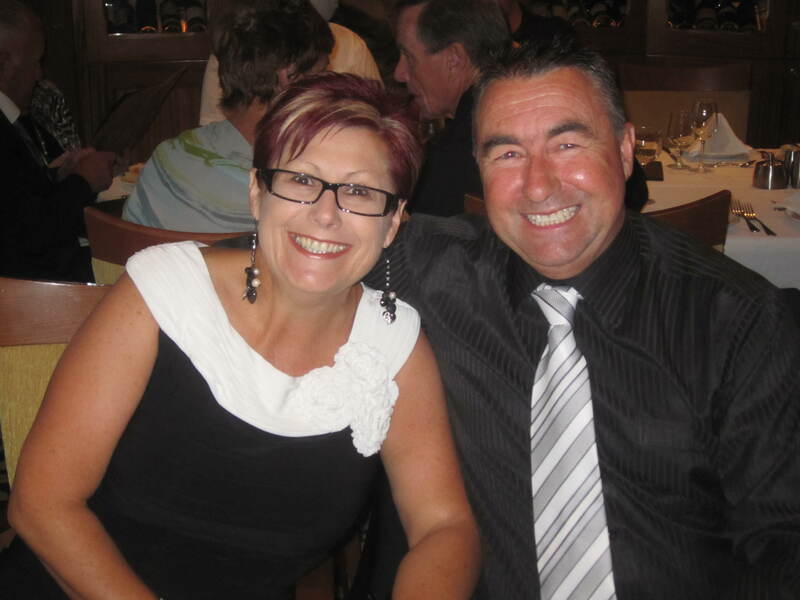 Seated with us were Sandy and Mick, Nerida and Chris, Lynda and Bruce, and Kerrie and Murray, a great bunch of fun-loving people. This entry was posted in Royal Caribbean International Cruise and tagged cruise, formal dinner, radiance of the seas, travel wrist bands. Bookmark the permalink.